The stock is trading at an attractive level. I can see a potential for this stock to double from current levels. The time required for this can be 8-12 months. You can see that the stock had broken out of resistance near 36.5 earlier in the month of Aug 14. After that breakout the stock rallied nicely to the levels of 115 to register a new high. As we know a huge run up can be followed by substantial correction, the stock moved all the way from high of 115 to around 36.5. This correction took place in the months of Jan and Feb 16. 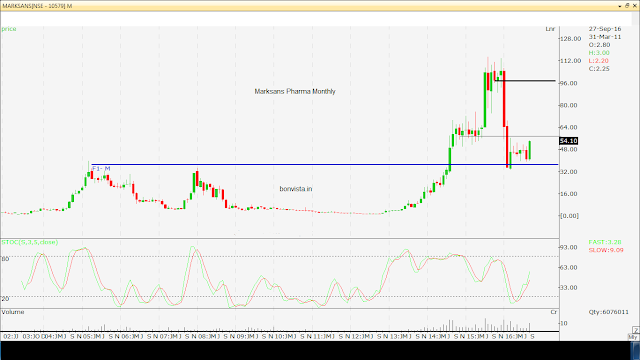 The stock then consolidated near its support for almost 7-8 months till now. In the meanwhile stock tested a resistance near 57 on multiple occasions. We know the resistance tested often becomes weak. Currently stock is trading near 56-57. We expect stock to break out of the resistance to begin a new journey above 57. Next hurdle is near 96. Disclaimer: The contents produced here are purely for educational purpose. They should not be construed as buy/sell recommendations. I am not a SEBI registered Analyst or Investment Adviser. Readers are advised to consult their Investment adviery before taking any decisions based on above write-up. Fundamental Vs Technical - is the debate worth?